I can't believe that it's been 3 years since my daughter's room got a makeover. Even when it was "finished," I knew I wasn't happy with the bed and had plans to change it out at some point. Fast forward three years, and many other projects jumped in line ahead of that one. However, her room got pushed to the front burner again recently when we decided to move her from a twin to a full bed. So, with the need for a new headboard and bedding, I decided to take the opportunity to freshen up this entire side of the room. Many elements will stay the same, but I am switching a few things around. The stripes are definitely staying, and I'm still working with the same fabric combo that was on her bed. I was able to adapt her bedskirt for the full mattress and have purchased a white down comforter that I plan to use a simple solid cover on. I'll use the fabric from her twin duvet cover above to make some new shams. I'll also be using a pair of swing arm lamps, although they'll have a different shade and I'll definitely dress them up a little somehow. The bamboo nightstands were a Craigslist find that have been waiting for a makeover. I'm planning to do glossy red with gold hardware, and using them to flank the bed. I'm undecided on the artwork over her bed. The framed photo of her is one of my all time favorites, but I've always been a little nervous about that large frame with glass hanging over her bed. Did you know we've been having regular 4.0+ earthquakes in OKC? Crazy! Maybe I'll make it into a canvas instead. 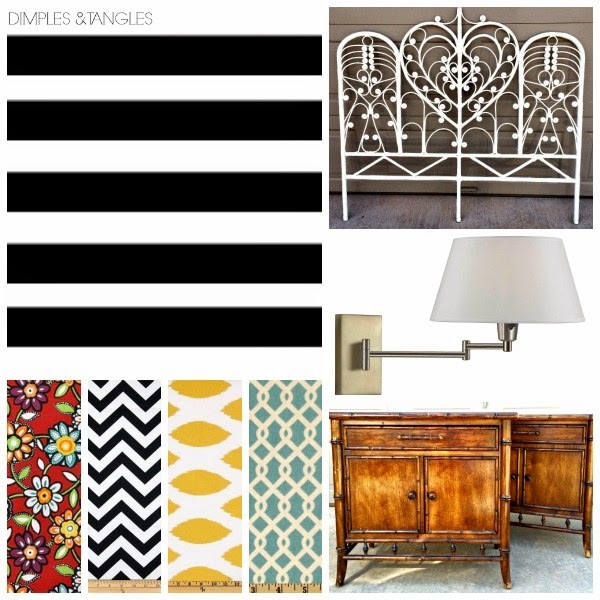 A few months ago I created a design board for the Crane and Canopy blog, based loosely on my daughter's room. I'll be incorporating several of those ideas in her room refresh. One project is already down... although she's informed me that she's not crazy about it at all. 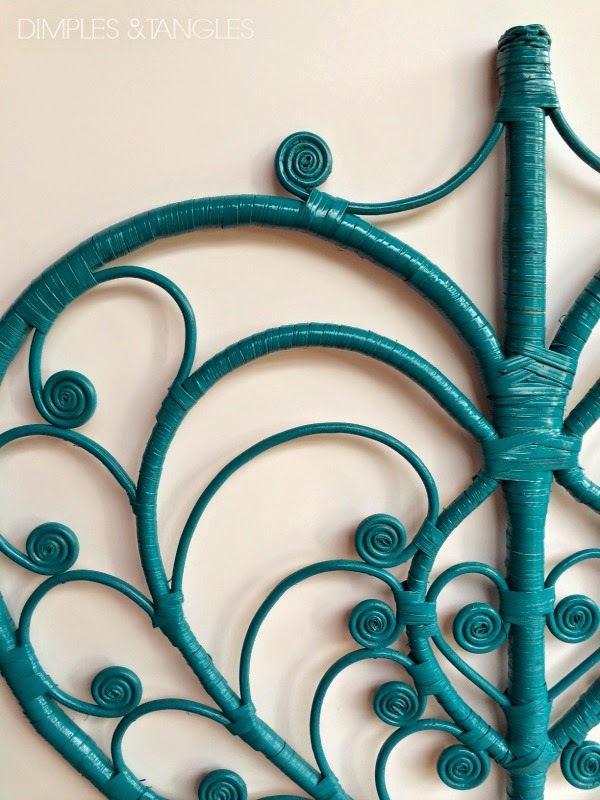 Seems like a vintage wicker headboard is not what she would choose, but I've assured her that this is just a "for now" quick fix, until I have time to do something different (hopefully an upholstered headboard, some day). On a personal note, thank you so much to those of you who have prayed for my Father in Law. He had a semi-surprise triple bypass surgery Friday night, and there have been multiple complications with his recovery. He's still in ICU and we're really praying that he is well enough today to remove his ventilator. We know that he still has a long road of recovery ahead, and right now are so thankful for each little step of improvement. The Lord is good and always gracious, and our family is trusting Him completely right now. Needless to say, blogging hasn't exactly been a priority this week, so thanks for being patient and hanging in there with me! Be sure to get those projects ready, it's time for Best of the Nest again on Friday! *Some affiliate links were used in this post. This just means that if you make a purchase through one of these links, I will receive a small commission at no cost to you. Thanks! you know i love that headboard and love love love those nightstands! it's going to be amazing! Your father-in-law will be in my daily prayers. Anxious to see the final reveal of your daughter's room. Jennifer I will continue to pray for your father-in-law. God Bless. Can't wait to see it all come together! I'm sure it will be fabulous! Continuing to pray for you guys. Glad he's making some progress. Hugs! Love the plans, Jennifer!! Can't wait to see it! Xo! SO sorry about your father-in-law I will say a prayer. 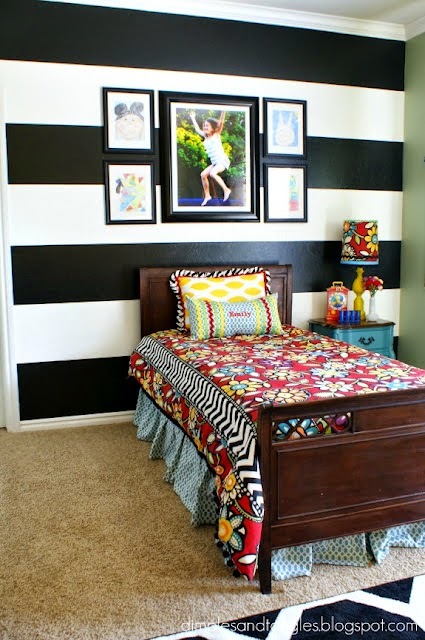 Can't wait to see your daughter's refreshed room and I love the headboard if that counts for anything! Praying for your FIL. I had a very surprise double bypass exatly 7 years ago, so I can relate. Had some complications 2-3 months out, but got through that too. I was so blessed with lots of praying friends. LOVE the chest/nightstands! Can't believe you're having earthquakes! Can't wait!!! So sorry to hear about your FIL Jennifer hope he's doing better and getting stronger...the power of prayer is strong! Jennifer I will continue to pray for your FIL and pray God heals him. Stay strong! Can't wait to see your daughter's room when it's finished. The room still looks great and yet your plans seem so ooh-la-la as well! Can't wait to see it! Hope your FIL is improving, praying for all of you! I'll bet Emily will end up loving the headboard once you've worked you magic on everything! Those nightstands are going to be amazing!! Can't wait to see the night stands! Red is my color ~ :) I'm sure she will love the finished product. I'm sorry about your FIL ~ will certainly hold him and the medical team in prayer. My kid's step-mom passed away today. Having her out of pain is a blessing, however, the finality is always difficult. Best wishes to your father-in-law! I am looking forward to seeing your bedroom makeover. I have learned so much from studying your photos! Some feathers found their way into a vase today. I had no idea about your father-in-law. So sorry Jennifer - my prayers are with him and your family that he's turned a corner and has a speedy recovery. Jennifer, the headboard, the nightstand, WOW! Can't wait to see it! Love the color you picked or the headboard! And those nightstands are perfect!! You know I love those nightstands! I've been on the hunt for some like that for forever! That headboard looks so good too, the bright color suits it perfeclty!